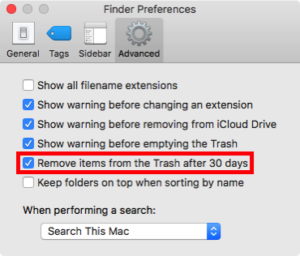 Would you like your Mac’s Trash to automatically delete files after they’ve been in the Trash for 30 days? If so, Apple recently added this feature to macOS Sierra (aka OS X 10.12). If you’re using an older version of OS X, the only alternative option is to create an AppleScript and schedule it to run repeatedly. Here are instructions for enabling this feature. Click the red dot to close the Finder Preferences window. Personally, I’m pleased that Apple has finally added this feature. It seems that some people either don’t know that they need to empty the trash or they forget to do so. Thus, it’s possible for megabytes or gigabytes of files to accumulate in the trash. This is basically just wasting storage space on the Mac. I also like how Apple chose to implement this feature since it let’s people have a 30 day grace period before files are removed. It might also be helpful to be reminded that Time Machine does not backup the contents of your Trash so only put files into the Trash that you truly intend to permanently delete. I hope you enable this feature and find it useful. Read more about 30 days, automatically, empty trash, mac os, sierra.